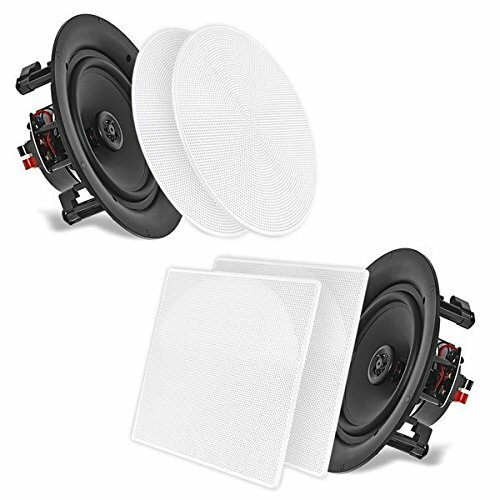 Total Unit Dimensions (Diameter x Depth): 9.5" x 3.4"
The Pyle PDIC66 two-way dual speakers deliver stereo sound to any room in your home or office without cluttering floor space. Each unit in the pair measures 6.5” diameter and come equipped with .5” high compliance polymer tweeter for a full, rich sound. Speakers are made of ABS material and include stain resistant grills. System comes with changeable round and square grill covers and cut-out template for easy and quick installation. They mount flush for a clean look on walls or ceilings. Achieve more wide-ranged sound performance and add audio to any room with the PDIC Dual Stereo Speaker Systems.